To most people, crowdfunding means that someone invented a thermos that sings “Yankee Doodle,” and it just raised $750,000 on Kickstarter. But that’s about to change. 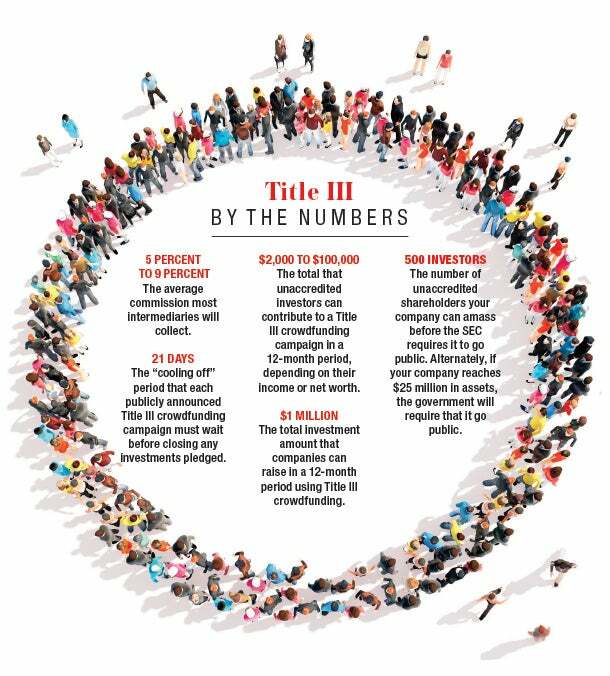 In May, a regulation called Title III, a part of the Jumpstart Our Business Startups Act, clicked into effect, and it has the potential to alter the way many startups are funded -- and how people use the word crowdfunding. The law itself, commonly known as the JOBS Act, is old news. It was passed in 2012, and part of it went into effect a year later. It initially allowed companies to publicly solicit and raise capital from “accredited investors” -- that is, people who the government determines are wealthy enough to take big investment risks, often meaning they have a net worth of at least $1 million. We’re not talking Kickstarter-style funding here, where backers are essentially buying a product ahead of time, or donating in exchange for a token gift. We’re talking about true investors getting equity in a company -- a very different kind of crowdfunding, available only to an affluent crowd. In May, the masses were finally let in on the fun. 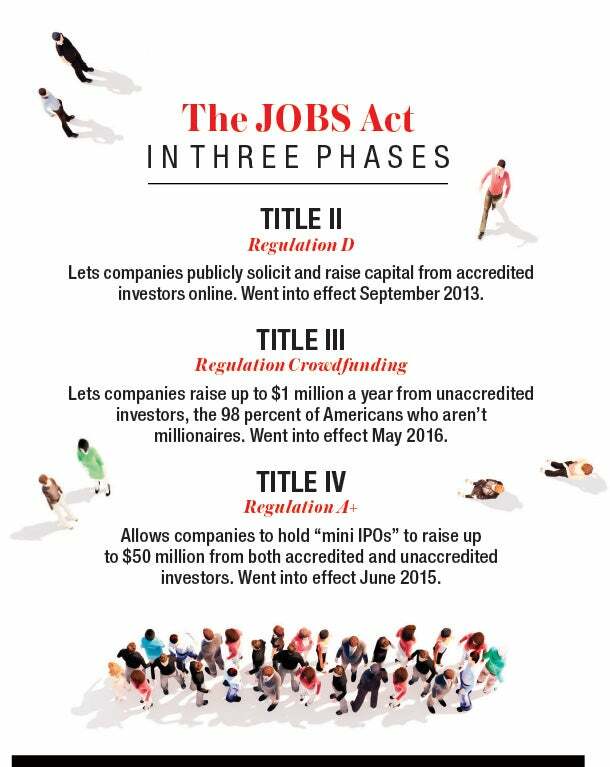 Title III allows early-stage companies to raise money from “unaccredited investors” -- that is, anyone willing to pay. At long last, it seems, here’s a level playing field for cash-starved startups that are too new or small to qualify for a bank loan, or to capture the imagination of deep-pocketed angel investors and venture capitalists. Now you can get money from the masses! Like Kickstarter, only with cap tables! It could be great for your young company, but don’t get too excited just yet. Like everything in finance and law, things are complicated. There’s a mountain of paperwork standing between you and that money. There’s also a limit: You can raise only up to $1 million during a 12-month period from the unaccredited crowd. And as you raise it, you’ll need to adhere to the Securities and Exchange Commission’s very strict rules and regulations. This is what you’ll need to know. Most kickstarter campaigns fail, and the same may become true for equity crowdfunding campaigns. Sometimes the crowd just isn’t buying what you’re selling. So before you pin all your hopes on the masses, consider what’s reasonably possible. If you have a consumer-facing company with a dedicated customer base (or the potential to grow one), you’re probably best positioned to benefit, says Aaron Pollak, CEO and cofounder of Venture.co, a broker-dealer based in Burlington, Vt. Why? Your product or service will be easy to understand -- a must if you’re appealing to casual investors. A difficult-to-comprehend business-to-business database for enterprise customers just may not sparkle in quite the same way. You should also consider your needs. Do you have a massively appealing commercial product? Maybe Kickstarter-style sites are still the best route for you: You’ll raise your money without giving away shares of the business. That’s what Andy Karuza is thinking; he’s the founder of FenSens, a wireless fender sensor, and he plans to presell on Indiegogo and keep all his equity. He does want investors but is interested only in strategic investors who can help his company grow. “That is one major benefit that comes with traditional investing,” he says. Also, consider how transparent you’re willing to be. “These companies have to publicly disclose their financials,” says Ron Miller, partner at the equity crowdfunding portal StartEngine, based in greater Los Angeles. If you require secrecy around your spending and growth figures, equity crowdfunding isn’t the financing vehicle for you. But if you’re willing to be open, the tradeoff could be worth it: Unlike just about any other kind of crowdfunding, equity crowdfunding will drum up “an army of brand ambassadors,” Miller says. They’ll be dozens or hundreds of people who invest and then sing your praises to everyone they know, if for no other reason than to see their own investment cha-ching. If you can rally those troops, you’re in business. For the old crowdfunding world, a Kickstarter-style website handled the back end. In this new world, you’ll also need a go-between -- what the SEC calls intermediaries, which can take many forms. You have options about which kind of intermediary to choose, but by law, you have no choice about this: You must use one. There are two main types of intermediaries: broker-dealers and funding portals. Broker-dealers like Venture.co, FlashFunders and North Capital do a lot of the work for startups and investors -- offering additional document drafting and investment management services, for example. They also allow startups to raise money in two ways at the same time -- through an equity crowdfunding campaign for those wealthy “accredited” investors while also raising cash from the masses. This may be useful to established startups that need growth capital. Funding portals such as StartEngine, SeedInvest and NextSeed offer a more basic option. Like Kickstarter, they’re basically a clearinghouse where startups and backers can find each other and interact online. But unlike broker-dealers, portals can’t insert themselves into the transaction -- say, by finding investors on behalf of startups or offering investment advice. The portals are just that: portals. Regardless of which you choose, you’re now up against a new challenge. The intermediary is going to vet you. Most important, it needs to make sure you’re following all the SEC’s rules. But it will also often decide whether your startup is worth its time -- and there’s no rule saying that it must list you. “We were always about quality over quantity,” says Ryan Feit, CEO and cofounder of SeedInvest, a platform that has listed campaigns for the accredited set and plans to do it for the unaccredited as well. His platform has listed only 1 percent of the companies that apply. If you pass the test, your intermediary will then walk you through the process -- ensuring that you have the necessary documentation and marketing materials. Once your campaign goes live, the intermediary will oversee all the financial transactions. And rather than leaving you to correspond with all your individual investors -- a red-tape nightmare that would strangle even the most detail-oriented ’trep -- you can use the intermediary to issue a quarterly update by email, webcast or another medium. Get some coffee. Then maybe an espresso. Title III comes with a lot of mundane paperwork, but you can’t let your eyes glaze over. First, you must file a Form C with the SEC, which essentially announces your intent to raise money this way. You must file annual updates with the SEC and post them on your company’s website. Your legal pros can help you nail these pieces, and all the tiny details along the way. You’ll also need to shift how you think and talk about your startup. As a ’trep, you’re genetically predisposed to turn the hype machine to 11 -- but in equity crowdfunding, silence is often golden (and also, the only legal option). You can’t talk about your Title III raise before it goes live on your intermediary’s platform, says Douglas Ellenoff, a corporate and securities attorney with New York City-based law firm Ellenoff Grossman & Schole LLP. That’s why you don’t see any entrepreneurs quoted here saying they’re gearing up for one. We called around, but everyone knows to stay mum. Talking to the media (or basically anyone!) before an offering goes live would violate SEC rules. And once your campaign is live, you can’t talk it up like a salesperson. The SEC does not take kindly to such hyperbole or sugarcoating. “This is a securities transaction,” Ellenoff says. “Language matters. You may not overstate your situation. You have to give an investor a true north accurate read of your opportunity as it exists today -- the good, the bad and the ugly.” Depending on state laws where you operate, big talk could be fined, or worse. “It’s not something where you slap together a video and people come running with their checkbooks,” Miller says. (Heck, that barely works on Kickstarter). So is it right for you? Between the legwork and the associated costs -- namely the equity you sell, the percentage points the intermediaries take of the funds raised and the thousands of dollars in legal and accounting fees -- equity crowdfunding may not work for young companies that need a couple hundred thousand to tide them over. But for ’treps who need mid-six figures and up, it could make the difference between getting a company off the ground and scrapping an idea altogether.